Awesome set and a nice bundle overall! if you can find both the free Lego figures and batman in stock for C&C you can get them for £94.98 + £20 lego voucher (see page for details) - you cant use the code below for C&C. Have lots of construction fun with the LEGO Batman Movie Arkham Asylum! Batman is sure The Joker is up to no good so defy Barbara Gordon’s warnings and enter the huge Arkham Asylum! Dash past the police car and through the x-ray security scanner at the entrance. Sneak past the GCPD officers, the head of the ward Aaron Cash and Dr. Harleen Quinzel. Watch out for the inmates exercising in the yard or eating in the canteen. Track down The Joker and send him far away to the Phantom Zone with the Phantom Zone Projector! Bust into Arkham Asylum with Batman™ and banish The Joker™ and the other Super-Villains with the Phantom Zone Projector element. This highly detailed set from THE LEGO® BATMAN MOVIE features the massive Arkham Asylum model with many different areas—including Dr. Harleen Quinzel’s office, ward office, four cells, an ‘x-ray’ security scanner, canteen, visitors’ room and laundry room—plus a separate five-story lookout tower, police car and loads of play-inspiring accessories. With 12 minifigures—and plenty of Super-Villain characters among them—also included in the set, the role-play possibilities are endless. 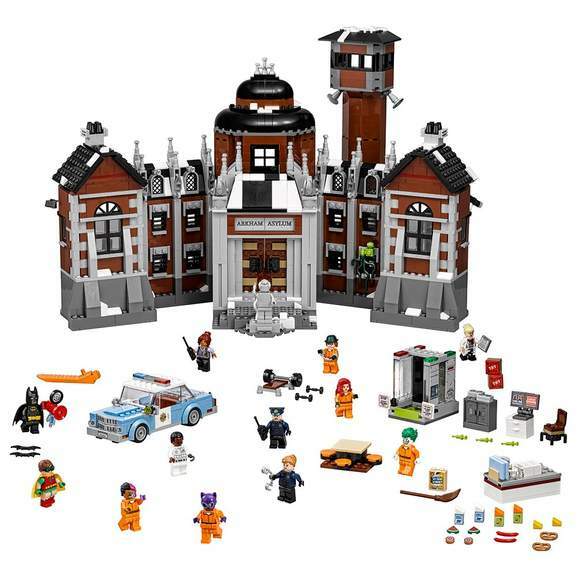 Includes 12 minifigures: Batman™, Robin™, Aaron Cash, Dr. Harleen Quinzel™, Barbara Gordon, Poison Ivy™, The Joker™, The Riddler™, Two-Face™, Catwoman™ and two GCPD officers. This action-packed set features a hugely detailed Arkham Asylum with a guard tower, plus a police car. The Arkham Asylum features a roof with chimney, decorative and snow elements, adjustable exterior searchlight-style elements, a statue in front of the large opening entrance doors, ‘x-ray' security scanner, Dr. Harleen Quinzel’s office, ward office, visitors’ room, four cells with opening doors and hanging vines outside Poison Ivy’s cell, canteen, laundry room, red phone box with a phone element, plus a separate lookout tower. Reveal a skeleton ‘x-ray image’ as you guide a minifigure through the security scanner. Help to run Arkham Asylum from Dr. Harleen Quinzel's office, featuring assorted elements including a computer, rotating chair and two syringes. Monitor Arkham Asylum with Aaron Cash in the ward office with assorted elements including a desk, computer, safe, donut and video tapes. Feed the prisoners in the canteen featuring a table and assorted elements including trays, plates, sausages, pretzels, donut, cheese, watermelon, and juice and milk cartons, plus a separate picnic table build with four minifigure seats. Visit the inmates in the visitors' room featuring a partition wall with window element and a phone element on each side. The laundry room includes two washing machines, washing powder box, broom and other assorted elements. Also includes weight training equipment elements like a bench for a minifigure with a barbell stand and barbell, plus two dumbbell hand weights. The lookout tower features five levels and assorted play-inspiring elements including a basketball hoop, two boxes of TNT explosives, three computer monitors and two loudspeakers. Police car features a removable roof to easily place three minifigures inside, opening doors, an opening trunk and translucent police-light-style elements. This set offers an age-appropriate build and play experience for ages 12+. Arkham Asylum measures over 11” (30cm) high, 18” (46cm) wide and 9” (24cm) deep. Lookout tower measures over 11” (29cm) high, 3” (10cm) wide and 1” (5cm) deep. Police car measures over 1” (4cm) high, 5” (15cm) long and 1” (5cm) wide. Still a good deal but was better when there was 20% TCB and free minifugures delivered. If they're in stock - there were none of these minifig sets at the Hull store on 20% day. good deal and price,try to get it click and collect if you can big lego sets and TRU delivery not great. Still a good deal but was better when there was 20% TCB and free …Still a good deal but was better when there was 20% TCB and free minifugures delivered. There should be 10% cashback with Quidco today. However my order only tracked at 3%. Hopefully it'll update on its own or I'll manage to get them to manually up-rate it.